Want a Thanksgiving Table That Will Impress Your Guests? Winston Flowers Offers Inspiring Design Tips. Setting the perfect table takes style and finesse—and it all begins with the right flowers. 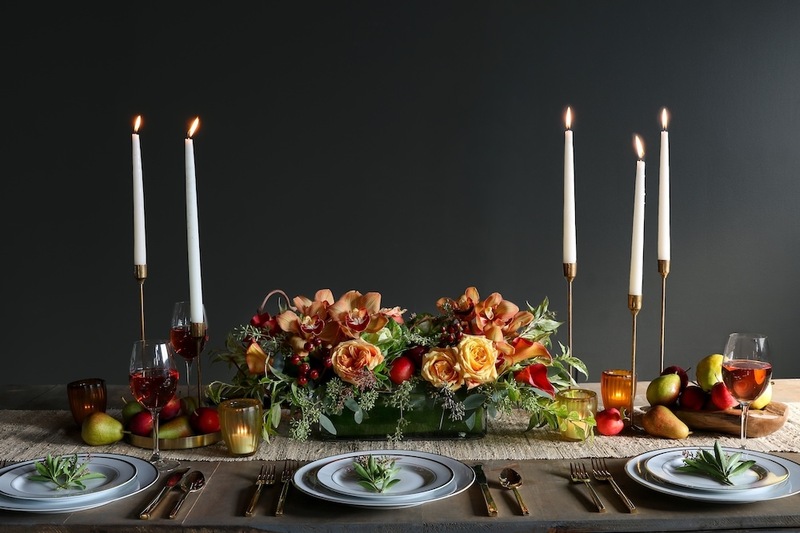 Winston Flowers offers table concepts of all shapes, sizes, and colors to help boost your creativity and bring your unique vision to life while impressing those who are gathered around your Thanksgiving Day dining table. Concept one is a Thanksgiving composite-style table, beautifully designed with a warm color palette of burgundy, orange, and amber tones. Our goal was to mirror the changing autumn landscape while featuring some of our favorite seasonal blooms, using an eclectic mix of vessels grouped together to create one cohesive look. 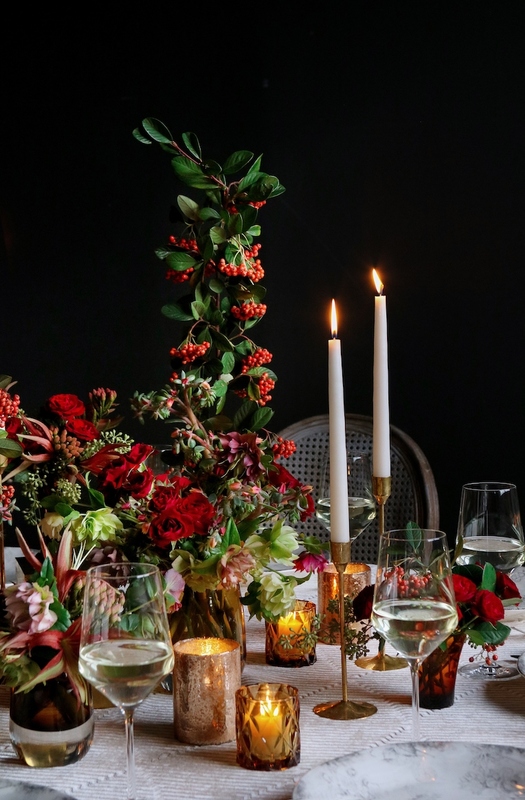 Within the floral design, we featured garnet gem spray roses, double hellebore, echeveria flowers, La Paz amaryllis, brunia, seeded eucalyptus, and towering stems of hawthorn, which is native to the USA. We also incorporated candlelight by placing votive and tapered candles throughout the set to offer a little sparkle for this festive occasion. The height of this design calls for the dramatic flair of ivory tapered candles in gold candlesticks, paired with rose gold-speckled and amber votives to reflect light throughout. Everything is anchored by an ivory geometric linen with a velvet finish, Guiletta floral patterned dinner plates, and wooden chairs. You can use whatever vases and vessels you have, no matter their size or shape, as long as their colors complement one another. Then, fill them with similarly shaded blooms. Filling a long table with family and friends requires a bountiful floral piece to be admired from beginning to end. An extra-long trough overflowing with an intricate design of flowers, foliage, fruits, and vegetables does just that, while also serving as the table runner. For Thanksgiving this year, this design is both traditional and non-traditional at once. It feels seasonal and autumnal—but with an unexpected color palette. Rather than customary oranges, yellows, and browns, here we use neutral shades, deep burgundies, and jewel tones to play off the unique wallpaper in the room. Our recommendation is to find that design influence in your home and bring it with your florals. Your guests could spend hours admiring the many details in this design. The shape of the long trough container grounds and textures, which sway with soft movement as if they’ve grown this way in the wild. The flowers, featuring Sahara roses, polychrome cymbidium orchids, scabiosa, sorghum, and steel, are woven into an abundance of fruits and vegetables like pomegranates, red pear, and brassica. Interlaced with autumn foliage, grasses, and other textures. For a twist on a traditional Thanksgiving tablescape, we created a statement centerpiece to serve as the table’s “star.” Unexpected flowers and textures, like dried elements and exotic flowers, make this especially interesting. Incorporating dried flowers in is a trend we love and autumn is the most natural time to use them. Here, we were inspired by the shape of a cornucopia. 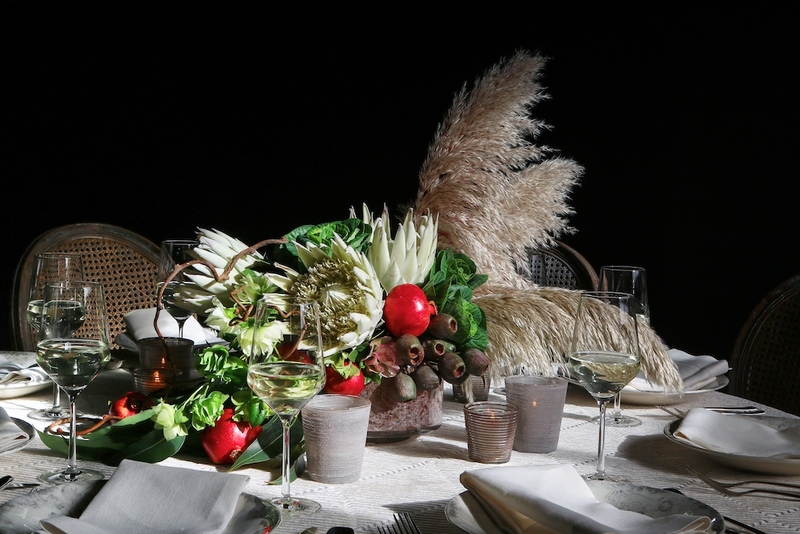 The design features dried pampas to give it some height, as well as king protea, double hellebore, and kiwi vine. We also included accents of green brassica and fresh pomegranates. The glass vessel resembles marble and ties in nicely with the cut amber glass votives and rose gold luster votives used for candlelight. 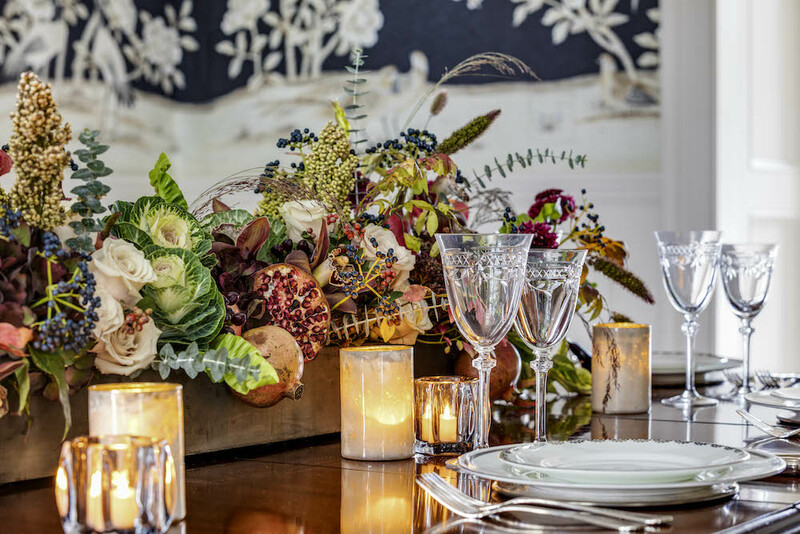 A long and low floral arrangement is the simplest way to add beauty to your table for Thanksgiving. This low design won’t obstruct conversation above it, while still filling the center of your table with a collection of beautiful autumnal flowers. Here we showcase the quintessential blooms and hues of the fall season: burnt orange roses, tangerine calla lilies, burgundy orchids, and red berries. Simply set the table with a neutral tablecloth or runner and add this traditional harvest look. Incorporate bowls of fruit and your own personal treasures to personalize the table as your own. Bring it all together with candlesticks of varying heights and votives in complementary color palettes for sparkle. Adding fresh fruit or green accent on each of the plates is a nice, natural touch, too. We were inspired to create a monochromatic design for an intimate Thanksgiving gathering, using inviting shades of plum, gray, and metallic. When everything on the table falls within these colors, a modern, “dreamy” setting is the end result. We selected a gray Tina Frey compote vase to hold any of plum to lavender flowers such as amnesia roses, cappuccino roses, dusty plum double lisianthus, and bridal veil protea. Textures like dusty miller and parvifolia eucalyptus, set in gunmetal bud vases, offer silver and green tones to the design. All of these shades tie in beautifully with the lavender velvet tablecloth and soft plum napkins. Accents of dark gray, metallic, and black offset the lavender hues. ‘Heirloom Smoke’ dinner plates and ‘Debutante Gray’ goblets work well with cut smoke votives, and old fashioned-inspired gold and rose gold luster votives add touches of warmth. 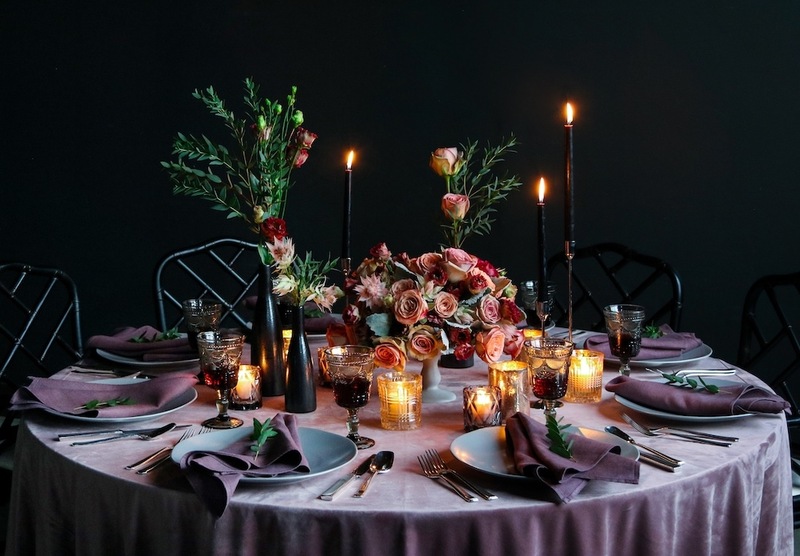 Multi-colored candles are another design trend—here we use black tapered candles—very dramatic—in silver candlesticks to complete this tablescape. To order your beautiful Thanksgiving arrangement from Winston Flowers, call (800) 567-7007.